In an interaction with Restaurant India, Prateek Soni, Co-founder of Foodport talks about what makes Foodport different and the ease with which customers can place their order. 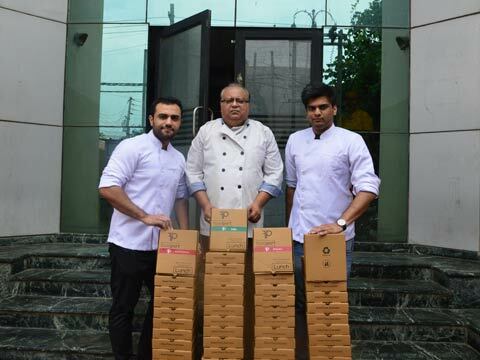 Launched in January 2015, Foodport is known for its versatile menu and for delivering fresh food. Foodport’s well-planned meals are not only tasty and healthy but are also high quality gourmet food at pocket-friendly prices. At present, they serve at select locations in Gurgaon. What was the thought behind entering the food business? One day, Aman (the co-founder) and I were speaking over the phone. We happened to ask what the other was having for lunch. Aman was having a boring thali from the office canteen, whereas I had access to a lavish gourmet meal. This stark difference in the lunch menu made both of us realize that there is a huge gap for people who’re looking for regular, healthy, inexpensive and nutritious meals. And “foodport” heartily fulfils that need. Tell us about the 30 seconds ordering model? You only need 30 seconds to place an order. Everything on the app and website has been kept simple. The app and website are user friendly, even non-tech savvy people can navigate both the platforms with ease. We’ve ensured that very minimum information is required to place an order and customers can complete their order in three taps. You have an expert chef – D K Soni in your team. What is the revenue sharing model between you both? Mr Soni is our founder advisor. So, there is no revenue sharing between us. All others are in-house chefs who are employed by Foodport. What makes Foodport different from other online brands? Our USP is – price, quality and variety. We are also working on adding speed to the mix unlike a lot of online brands; we prepare our ‘product’ ourselves and also control the complete supply chain – from getting the order to delivering the order. No part of our business is outsourced. We can thus, control both quality and cost. We are always on the lookout for avenues to innovate and improve our products and service, ensuring that we stay competitive in the growing food tech business. How do you do the packaging to ensure that the food remains healthy? We have packaging advisors on our team and we also conduct a lot of research before selecting the packaging material. Currently, we are working to develop bio-degradable packaging material. Primarily, the millennial and all working professionals are the target customers. What money have you been funded recently? We are a part of the GHV Accelerator program, working under the guidance and mentorship of Vikram Upadhyaya, Chief Evangelist and Mentor at GHV. We received a seed investment of US$ 100,000 as a part of GHV’s Acceleration program. Currently, we are operating in Gurgaon. We are looking to expand to all the metropolitans, starting with Delhi and Noida in 2016. \"We are looking at expanding both DeeZ and Filmy ..